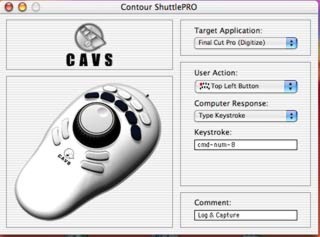 On a number of FCP sites I have found users who are having difficulty understanding how to set up their Contour ShuttlePro in a manner that will give them value for the money spent. To assist any FCP user who may be having a less than stellar experience with their jog Shuttle, I have put together a short tutorial on how I use this unit. 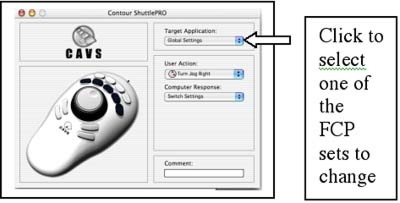 Assuming that you are working in OSX, the one thing you must really bear in mind when using the Shuttle is not to program the button in the lower right hand corner below the jog wheel. This button has a very special function in OSX that it didn't have in OS 9. 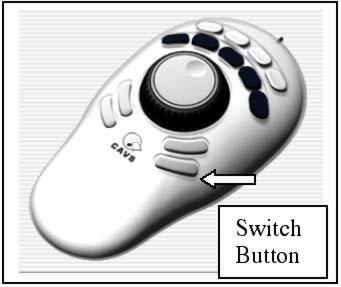 This button is known as the Switch button and it allows you instantly switch between the various sets of the 12 other button commands. Therefore you should regard the device as a 12 button command pod with a 13th button that allows you to switch to the next set of 12 commands. You can add as many sets of 12 button sets as you wish. If you wanted to, you could set virtually every keyboard shortcut known to FCP into the device. You could do this as well in OS 9, but it wasn't worth doing because the manner of switching from one set to the next was cumbersome. Everyone that I know of stuck with a single set of button commands. The Switch button in the OSX version changed all that. It made the Shuttle infinitely more useful. As I already had the entire keyboard shortcuts committed to memory, I didn't spend a great deal of time setting up the sets of commands. I simply added or modified a command set when it occured to me that I could add something that would speed the editing process beyond what could be achieved by the keyboard shortcuts on their own. When you press the Switch Button a line of text appears in the upper left corner of the Final Cut interface, i.e. above the Viewer. This button is a toggle that each time you press will cycle through each of the sets of commands you have added. Contour supplies 3 sets of commands (Digitize, FF, and JKL N/T) with the same 12 commands set to the same 12 buttons in each set. Obviously they never intended anyone to use these particular sets of commands as these are easily done from the keyboard (IN and OUT, Previous and Next Edit, etc). They are just there to provide an example of how to go about assigning functions to the buttons. Below are my current sets for FCP 3. They work to save me time on the productions I am working on. Your mileage may differ. Set whatever commands will help you get more work done in a given time period. The 4th set, the Color Corrector Set, I added. I'm sure I will be adding extra sets when it occurs to me that I can edit more efficiently by doing so. 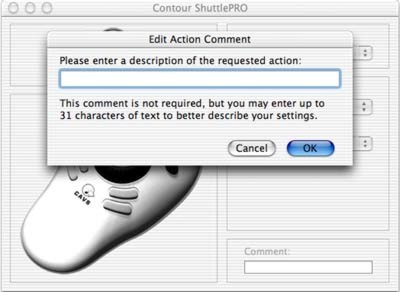 After you have installed the drivers for the ShuttlePro, drag the Shuttle icon to the Dock. Then Control F3 will open the Dock. With the down arrow key you can quickly descend through the icons to the Shuttle Icon. Press the enter key to open the Shuttle interface. In the interface above, under Target Application, you can see it is set to Global Settings. This is a generic set that will work more or less effectively in most applications. If you want a set that works in Photoshop or Internet Explorer or in this case FCP, you must choose your application in the Target Application drop down menu. 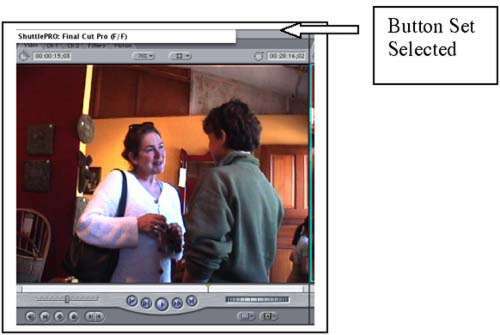 Once you have selected one of the FCP sets that you wish to modify, you proceed as follows. Press one of the buttons on the Shuttle. In this example, I have chosen the 1st set, the Digitize Set, which now appears under Target Application. I have pressed the Top Left Button on the Shuttle. Notice under User Action the box now says Top Left Button. The default command in the User Action is Switch. This is the User Action for the 13th button, the one you must not change if you want to be able to switch between the various sets of key commands. Its not fatal if you have already changed it. You can reset this key to Switch by going into the drop down User Action menu and choosing Switch. The computer response I have chosen is Type Keystroke. In the Keystroke box below I have entered the shortcut for opening the log and capture window. This is not Contour's default command, which is Delete In. As it is hardly ever necessary to delete an in or out point (the far left and right buttons on the top row), I reassigned these to other functions. The Keystroke command is entered in the box by selecting the box and pressing the keyboard shortcut on your keyboard. The command is then automatically added to the box. Finally you add the name of the editing function in the Comment box at the bottom. When you click on this box the Edit Action Comment Box opens and you type in the name. It will probably take some time before all these sets of 12 buttons are embedded in your memory. I suggest that every editing session before your client arrives, you open the interface and quickly press each of the buttons in turn to refresh your memory. As you press each button you will see in the Comment box the command you have assigned to that button. I don't make much use of the Jog/Shuttle on the unit. The JKL keys on the keyboard handle that function quite well for me. I use the Jog wheel to move 1 frame forward or back when trimming. The button above the Switch button, on lower right side below the Jog I use for making a cut (Control V). With the Shuttle placed on the left of the keyboard, and my index finger on the jog wheel, my thumb rests naturally on that button. I make the cut with my thumb, jog I frame left or right with the index finger to the side of the cut, which is the trim. While doing this, the index finger on my right hand is maneuvering to the X key on the keyboard to mark the trim. I moved the ripple delete button to the lower left button immediately under the jog. With my index finger on my left hand still positioned on the jog wheel the 4th finger rests on this button. This combination enables me to do a cut and trim in about a second. As I am quite proficient with all the Keyboard shortcuts for FCP, the challenge for me was to find ways to speed up the process of editing even more using the Contour device. Because the Q key on the keyboard is only a 2-position toggle (Viewer/Canvas) rather than a 3-position toggle like the U key (Roll/Ripple Incoming/Ripple Outgoing). I decided to assign the upper left button on the 5-button row above the jog to the function of selecting the Browser. If I had not done that, it would have been necessary to have both hands on the keyboard to do Command 4 to select the Browser. Even worse still I could lose even more time by using my trackball to navigate to the Browser and click. To use the mouse or trackball of course is fine if you are working on your own productions where you can spend as much time as you like. When editing for clients being fast can sometimes be as important as being a good editor. I had the idea of assigning shortcuts to the various steps on the Shuttle wheel. I abandoned that idea as without click stops on the Shuttle it would be difficult to tell which range of the Shuttle I was in and I could easily and accidentally trigger the wrong keyboard shortcut with the shuttle wheel. I use the Shuttle on the left, as I am using a Logitech cordless trackball on the right and the trackball is at the right thumb position. I can hardly wait for my FCP4 upgrade to arrive which will allow me to use the scroll button to do vertical scrolls in the timeline. This will save me from having to do Shift Page Up & Page Down. I'm more or less ambidextrous, so I use whichever hand lies closer to any object. Maybe that's the case for most people, I don't know. The Lightworks Mark and Park command sounds like it may be similar to a nice feature in FCP4, the Dynamic Cut that is automatically applied when you press the K key. (providing you have selected this function) I'm not a Beta tester for FCP so I'll have to wait until the upgrade arrives to see how this is implemented. The multiframe trim (Shift + right or left square brackets) allows you to trim several frames at a time with a single key press. The default is 5 frames. You can change that by going to the preferences (Option Q) and changing the third item down Multiframe Trim to a higher number. Even though you may enter 15 in this setting, (as of FCP 3) 9 frames is the highest that will be recognized. Another nice addition to FCP 4 is that this option can now be set as high as 99 frames. I probably won't be using this new setting as I find it easier to simply enter 115 on the keypad if, for example, if I wanted to do a second and a half trim. I want to spend the bulk of my time when editing on structural decisions. I want the technical process to be more or less subliminal (instantaneous). Whenever I find that the technology is slowing me down, I look for a way of streamlining the process. I therefore use all the keyboard shortcuts. The 1st thing I did with the Shuttle was to add commands that required the use of modifier keys to single button presses on the Shuttle. This cut down on hand movement on the keyboard. For example I have a client who finds it easier to visualize what I am doing if sequences are edited completely on the timeline rather than by using a Viewer to Timeline method for doing an assembly. He then decides that he wants to place a series of shots in a totally different position in the timeline. Fine. I can accommodate to that approach. I added the Cut to Clipboard and Paste Insert to the Shuttle buttons to allow me to do this in a second or two. One of the attractions of the craft for editors is that no matter how many times you review and work on a cut you can almost always find a fresh approach. The same phenomenon applies to the technology. We all find there are times when we will chose an alternate method of doing a trim because at that moment it instinctively just feels right to do so. The Contour ShuttlePro fits right in there. Often it will save you time and sometimes it will just satisfy an instinctual impulse. Dave Hardy is a member of the Vancouver Final Cut Pro user group. In 1987 he set up the full time day program for the Vancouver Film School He was head of instruction for the program from 1987-1990 and taught courses in Film Editing and Cinematography. Today Dave is a freelance Final Cut Pro editor in Vancouver. For the past 3 years he has been teaching private workshops to editors and assistants who wish to get up to speed quickly with FCP.